The Latin from Satu Bumi’s Classic Range of GRC Pots provides classic lines and a quality appearance. 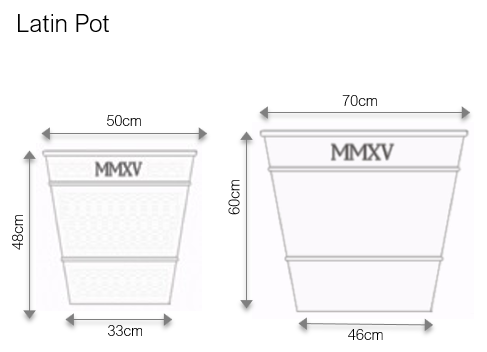 The Latin Classic GRC Pot is available in two sizes and has a smooth texture on a well known shape with a catchy set of Roman numerals that adds a touch of interesting differentiation. The Latin is available in a number of old metallic and old stone colours that provide a traditional and appealing aged appearance. It is also available in virtually any painted colour.